The LG G8 ThinQ was announced around one month ago, but at the time, there wasn’t any launch or pricing information available for the new flagship. Now we’ve got those details for you. 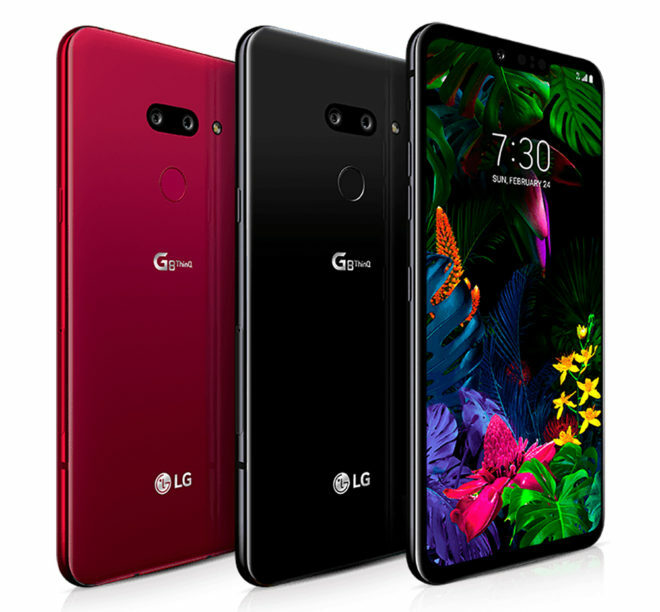 T-Mobile will launch the LG G8 ThinQ in stores on April 12th, but you’ll be able to pre-order one starting April 5th at 5:00 am PT. It’ll be available in Aurora Black and Carmine Red color options. T-Mo’s pricing for the LG G8 ThinQ will be set at $0 down and $25.84 per month for 24 months on EIP ($619.99 full retail price). If you’d prefer JUMP! On Demand, you can score the LG G8 for $0 down and $27 per month for an 18-month lease with a residual payment of $133.99. As with most major device launches, T-Mobile will have deals on the LG G8 when it arrives next month. The new LG flagship will be available for $200 off MSRP upfront, which is why T-Mobile is asking $619.99 for the G8 while LG’s normal price is $819.99. You can also get up to half off the LG G8 via monthly bill credits when you trade in a qualifying device or add a new line. Devices that qualify for trade-in include the iPhone 7 and 7 Plus, iPhone 8 and 8 Plus, Samsung Galaxy S8 and S9 series, Samsung Galaxy Note 8, LG V30 and V30+, LG G7, Google Pixel and Pixel XL, Google Pixel 2 and Pixel 2 XL, and the OnePlus 6T. The LG G8 includes a feature called Z Camera that enables features like Hand ID, which identifies you by the veins in your palm, and Air Motion, which will let you perform actions like answering calls and adjusting the volume by waving your hand in front of the G8. LG’s new flagship also uses Crystal Sound OLED tech that enables its 6.1-inch 3120×1440 screen to double as a speaker. Other notable specs of the G8 include a Snapdragon 855 processor, 6GB of RAM, 3500mAh battery, and a dual rear camera setup with a 12MP camera and 16MP ultra wide angle snapper. It comes preloaded with Android 9 Pie and will include support for T-Mobile’s 600MHz LTE coverage. Now that we’ve got its pricing and launch details, what do you think of the LG G8 ThinQ? WIll T-Mobile’s aggressive deals convince you to buy a G8? Hats off to T-Mobile for slashing the price down to $620 already. LG products have been so expensive at launch and typically see early no strings attached proper BOGOs and also depreciate so quick. The BOGO should be early on this model soon too lol. Unless you must have the latest and greatest, the V40 at its current price of $600 is a better deal since it does not require a trade-in. V40 is a good phone. If you want a serviceable phone that support all of T-mobile’s current bands, and has OLED, get the V30. Ebay has T-mobile ones on sale for about $300 right now – I have seen new in box T-mobile one for $250. Be sure to make sure it is a T-mobile model number if you go the Ebay route. V40 is H932, V40 (and I haven’t seen deals yet) is V405TAB. Note that LG has some “international” phones, but they do a good job of supporting USA bands – I would avoid these. Many folks have gotten burnt buying LG “international” phones. I bought a T-mobile V30 over ebay and it seems to work OK. Though I have some quibbles,(The phone reports data is being blocked on 600 and 700mhz links every so often) I need to figure out if it is my phone or T-mobile. My wife dropped her Nexus 5x on the street and it was run over by several cars last week – so we were in need of a new phone. Wife is complaining, but we have been waiting for this phone as her next. Glad it will finally arrive! Probably true – but also more expensive. This is good and all, but It would be great if Android Pie was released for the LG V40. Decent price.. may consider it. Also, I was hoping that they would accept my wife’s V20 as trade-in (maybe $100 or $150) but no luck. The V20 is not on the list. The V20 is on the long list. There is a group that qualifies for the $310 discount, a list at $200 and a list at $100. All are monthly credits over 24 months. Can you please point me to the long list? I’d like to make a decision soon to trade in. I don’t think there is one yet. But if the past is any indication, there will be one posted once the promo starts. If they had let me trade in my V20, this would have been no brainer. Oh well. Lots of time Lg,Samsung,has better deals from there sites,for both unlocked phones,carriers models. I would check out Lg,1st and see what kind of deals they have for this phone. April, the FOURTH month of the year is just around the corner…. I would like to know how much longer til 600mhz is flipped on in more markets, Houston, Baytown, Galveston………. It’s all hype so far. I wouldn’t lose any sleep waiting for it to be deployed. I assume this will have all of TM’s bands. I think my G6 will last until next year when 5G comes out. No phone loses value quicker than LG. Even at $200 off MSRP you could wait and buy it for even less by the end of summer. I’m still hanging on to my G6, waiting for 5G phones from LG. Same here. I’m hoping my G6 lasts another year.